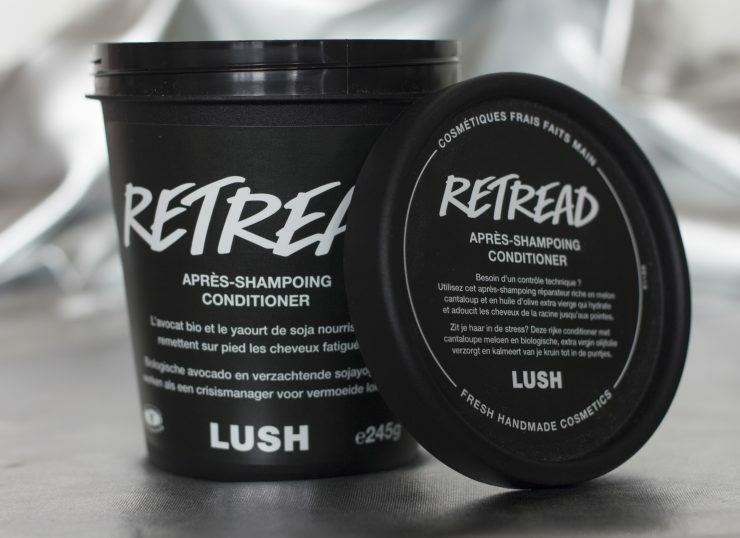 Retread is a conditioner from lush that I’m using with much pleasure for my unmanageable, dry & colored hair. I’m using this product for a few years now, especially when my hair needs a boost. I already wrote a review before about this conditioner on my previous blog… But because I chanced my blog name that blog doesn’t exist anymore… So all my articles are gone… So I just thought let’s just write my review about the retread conditioner again. Because I think that this is my 4e or 5e packing of this product…. According to lush must this conditioner close and recover the cuticle. Retread contains oils like: avocado, jojoba and extra virgin olive oil for a rich nourishment. It also contains protein out of yogurt and soy milk to make your hair stronger and also for an extra pretty shiny. This is of course something personal. But I don’t like the smell from this conditioner. It’s not annoying but I really don’t like it. But what I do like is that this conditioner is in a pot and not in a bottle. Why? Because it’s easy to get all the last bits out of it. And… Yes, because 5 empty pots give you a free lush face mask. Lush bottles don’t count for that action in Belgium… So that is another positive thing. 😉 But of course the most important… How does this creamy and rich conditioner work? Amazing! It really works amazing! If you have unmanageable and dry hair is this a real treatment for your locks! You don’t need much to get your locks healthy and soft again. If you have like me dry, fluffy hair then is this rich conditioner amazing! But if your hair is not that dry then I wouldn’t recommend this rich conditioner. Then is this one to rich for your hair, but then is American cream more something for you! But if you have like me really dry hair than your locks will be thankful if you use retread! It’s a fantastic but mainly rich conditioner that gives your locks the treatment they need! This lovely conditioner, retread from lush let your dry hair feel fantastic again and cost €16,95 for 245gram. I have to try this hair conditioner because it looks amazing. In fact, I love Lush products!